A classy gaming site with a distinct European flair, Golden Euro kicks off your fun with a generous €200 Welcome Bonus – just activate this bonus code and you’re on your way. With over 150 games you’re sure to find what you’re looking for from their selection of progressives, slots, table games, video poker and specialty games. Play Happy Trigger at Golden Euro Casino! NOW…through March 31, get 10 FREE SPINS – no deposit necessary! ALSO…get double deposit bonuses up to 100 euro! AND…20 more Free Spins on Trigger Happy with a deposit! Check out this new game – it’s a HOT one! Check out the Golden Euro Casino Review to find out more about this top-quality online casino forum. Casual and high-rolling players alike will thrill to the Golden Euro online casino where they can find top games, big bonuses, multiple platforms and easy ebanking procedures when playing on any PC or mobile device. The Golden Euro Casino has been online since 2012. The casino offers gamblers in Europe, America and other areas of the world a genuine Las Vegas Casino event online. Players can access over one hundred and fifty casino games at the click of a mouse or with the flick of a finger over a mobile touchscreen. Golden Euro Casino stands out from the crowd. You’ll enjoy superb graphic quality, a vast games lobby full of choices for any gaming level, betting preference or experience level and multiple platform access. Just open your personal casino account and start playing at your leisure. Golden Euro offers top casino games including interactive online slots, specialty games, table games, card games and more. If you enjoy the old-fashioned games of poker and blackjack you can select a game variation that meets your individual playing style and level. You can play Loose Deuces Poker, Bonus Deuces Wild Poker, Sevens War Poker, Jacks or Better Poker, Aces and Eights Poker and more. For Table game enthusiasts the options are even bigger. The table games at the Golden Euro Casino are no-limit games. You can compete at a wagering level that meets your gambling entertainment budget with no pressure to increase your bets above and beyond your wishes. Some of the table game choices at the Golden Euro Casino include 3-card Rummy, Match Play 21 Blackjack, Baccarat, Face Up 21 Blackjack, Tri card Poker and European Blackjack. Golden Euro’s slots lobby brings fantasy and entertainment to the gaming screen. The Golden Euro slots are powered by the Realtime Gaming Developers. RTG brings interesting themes and engaging storylines to life. The colorful images and engaging characters create an interactive gambling event that allows you to experience fun and excitement while you achieve real money wins. Some of the Golden Euro’s most popular slots games include the whimsical elf-inspired Lucky 6, a slot that features the intriguing magician Ronin, the goofy Cash Bandits slot machine and the curios tales of Ocean Oddities. There are low-payline slots and slots with 40 paylines or more. Other options give you the chance to select a slots that meets your individual needs and expectations. There are slots that offer Free Spins rounds, Gamble Games, expanding reels, Wilds, Scatters and more. Players who are looking for a more action-filled slots event can join a progressive jackpot slots and compete against players from around the world in spirited slots competition. When you join a progressive jackpot game you’ll play your game as you normally play and achieve the regular game wins, the free spins wins and all other game featured wins. Simultaneously, you can play the progressive game by making a side progressive jackpot deposit. As you spin the reels you’ll watch to see if your spin brings up the jackpot. If it does, you win! Hundreds of thousands – even millions – of dollars! Golden Euro believes that the fun of gambling is enhanced by the thrill of the game rewards – the bigger the prizes, the more engaging the gaming event! The casino offers a wide range of bonus codes for every level of gambling. The Bonus rewards begin from the moment that you enter the casino with a $200 Welcome bonus on your first deposit. The Welcome Bonus continues with a 2nd part of the first week bonus give-aways on a $20 deposit. The bonus code that allows you to access the Welcome Bonus is “GoldenWelcome”. You can continue your Golden Euro bonus code fun with a 25% cashback on any deposit in which you had a playthrough of 10x with no minimum payout. The customer support team will help you get your cashback return of up to $250. The Weekend Bonus package with two $100 deposit bonuses and a free bonus. The coupon code will be sent to you through your email. The Weekend Rebate involves a 105 rebate bonus on weekend deposits. You claim your weekend rebate bonus on the Monday following the weekend of your gambling event. The Weekend Rebate is good for minimum deposits of $2 and goes up to maximum deposits of $100. Maximum cash-out equals up to 5x the bonus amount. Tuesday players have an unlimited 305 deposit bonus on their Tuesday games and Sunday players enjoy a 50% Lazy Sunday bonus of up to $100. The bonus gifts are in ADDITION to the Comp Points that you earn – one comp point for each 10 dollars wagered. When you reach 100 comp points, you convert them to real money gaming points through your casino account and play more games for more time for free! The Golden Euro Casino is licensed by the Director of Offshore Gaming of Antigua and Barbuda which monitors the casino to ensure that the software provides for fair gaming practices and casino security protects your identity. When you’re ready to get started, press the green sign-up button in the upper right-hand corner of the page. Then press the blue button to access the signup form. Submit your first and last name, your email address and a password. Confirm the password and submit the form. You’ll receive a confirmation email – confirm your new account through your personal email and you’re ready to go. The Golden Euro support team is available 24/7 to assist you with any questions, queries or concerns. Call the casino at +800 22 34 46 76 or email them at support@goldeneuro.com for quick, friendly support. You can play any of the casino games via your new account for free in the Free Mode. When you are ready to play for real money, you’ll need to link your ebank to your account. 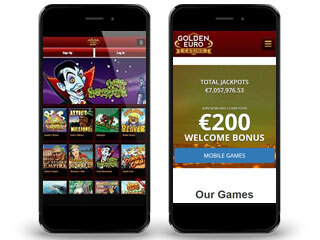 Golden Euro Casino interfaces with multiple Internet banking solutions including VISA, MasterCard and American Express debit and credit cards, Neteller, Skrill, EcoPayz and PaySafe ewallets and the Wire Transfer solution for direct transfers of funds to and from your personal bank account. Once you’ve linked your account to your preferred Internet bank you’ll be able to deposit funds into your casino account and then withdraw them at your leisure. You’ll experience a high-quality, real money gaming adventure when you play at the Golden Euro Casino. Read the Golden Euro Casino Review to find out why.